Purpose is a hot topic these days. A sound purpose not only orients an organisation’s long-term strategic goals, but also catalyses employees, consumers, and external stakeholders to join their cause. 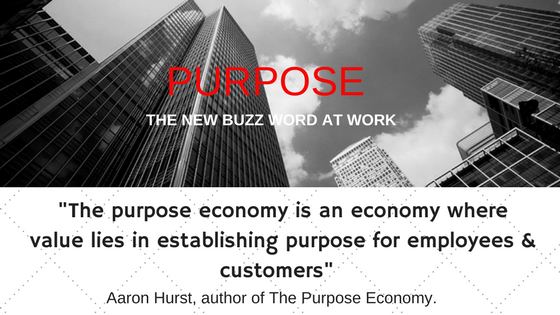 It has many famous advocates; some using the word explicitly, like Aaron Hurst does in his book The Purpose Economy and others, like John Mackey, founder of Whole Foods, who features it implicitly in his book Conscious Capitalism. Coaches and counsellors talk about the word purpose in the context of helping people feel more engaged by life; without a purpose most of us feel rudderless. But do we spend enough time considering our individual purpose before we chart a course to a successful career? I know I didn’t back when I was starting out! I feel many of us now well into our working lives were told to go out there and get a job and be thankful when we find it…ideally in a secure industry like banking! But these days; such an approach just won’t do. “‘soft’ skills’ are in demand with CEOs seeing the value in marrying technology with exclusively human capabilities” and that CEOs “believe the most important are the uniquely human collaborative capabilities that can’t be replaced by machines”. Another facet of this research that is interesting is that relationship based strategies, like strategic partnerships and collaborations with competitors, account for a large percentage of the various ways organisations are looking to harness disruption – giving the strategy of investing in new technologies a run for its money in the ‘how to harness disruption’ stakes! And relationships are strengthened and more likely to endure if they’re based on a shared purpose; this can only be authentic if the people driving these partnership and collaborations understand the WHY before they figure out the what and the how. View the full online report here. All of this is why I’m putting purpose at the heart of the next big thing to come out of this distillery of life and all things great about it. Intrapreneurs Squad is aimed at young professionals eager to create their dream career and managers looking to understand how they can support their yearling professionals do this. And maybe they’ll be inspired to set a new course for themselves into unknown purposeful territories. So what is a dream career? A dream career is one that gives you plenty of scope to create, be a change-making professional, use your initiative, have autonomy and feel as if you’re making a difference in the world somehow through purpose-driven innovation. Intrapreneurs Squad will have its first session on Thursday 30th March, 6-8pm, BOI Workbench. This meet-up is a precursor to a Summer Intrapreneur Bootcamp weekend for young professionals aspiring to become corporate changemakers or entrepreneurs. I am very excited about this one. I believe if we get the work-life right from the start, we’re well placed to experience a truly great life. It took me a while to do that and I want to share the work-life lessons I’ve learned in my quest to get mine right with people at the beginning of their journey to take on the world! !